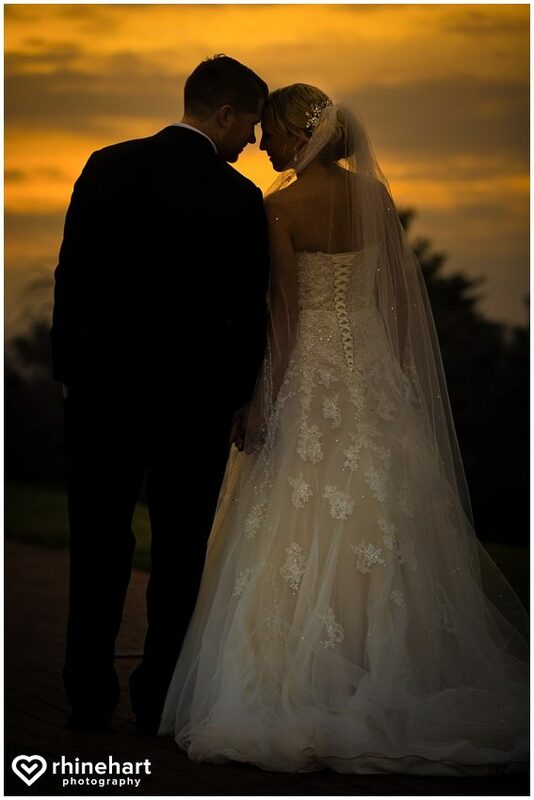 From Neil serenading Anna on bended knee to experiencing an incredible sunset on the stunning grounds of The Hotel Hershey with the scent of chocolate in the air– Anna & Neil’s wedding day was straight out of a fairy tale! Anna shared, “I’m really anxious to see photos of our family and friends and some of those artistic shots!” Well, here you go Anna, this was a really tricky photo I captured in camera with Anna and her wedding gown… I love that it also ties in the plum color that her bridal party wore. 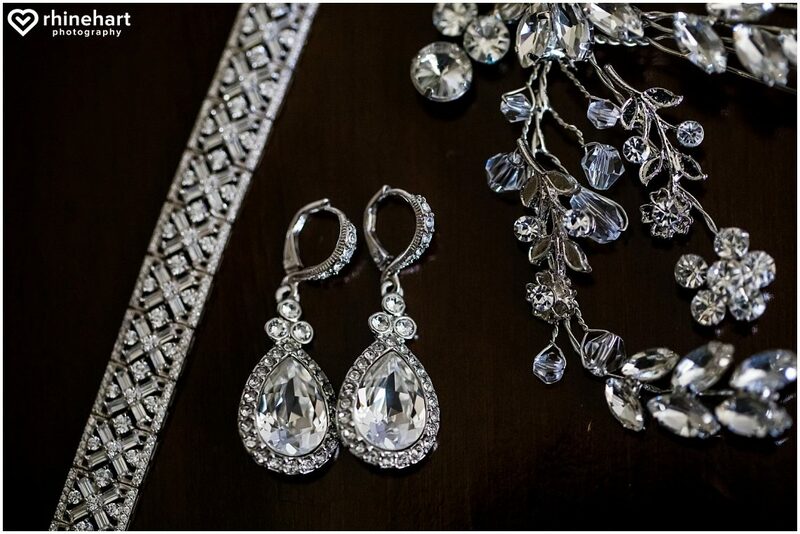 Anna explained the style of her wedding, “We wanted a romantic, wintery feel with plenty of sparkle.” Her wedding gown and jewelry started off the morning with some sparkle! Cheers to Anna & Neil! Here two of her bridesmaids admire the dress and take it down so that Anna can get dressed. 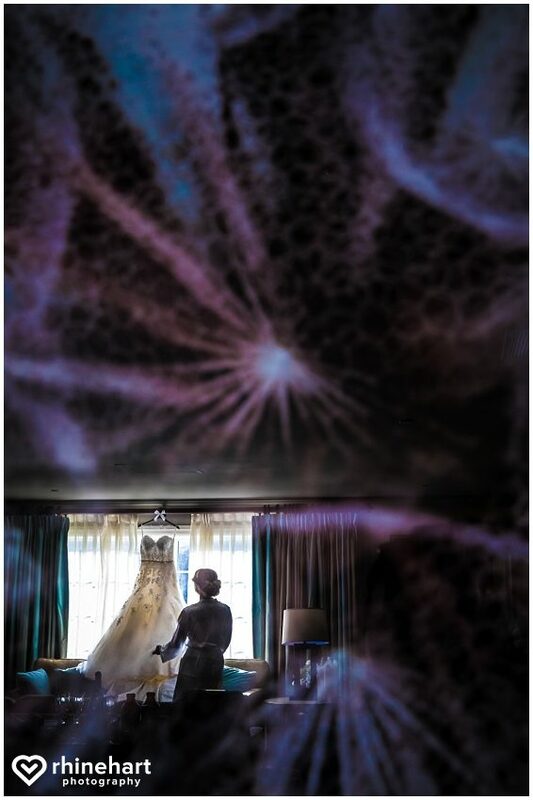 I love to use different elements in the room to add a little artistry and pop, there was so much for me to work with in the Hershey Lodge bridal suite! Here is her beautiful wedding gown from White Swan Bridal Boutique. Khara Williams Make Up puts on a few final touches. I silhouetted them together in the window and I love the contrast of Khara’s hair down, standing with the make-up in hand and Anna’s hair up, sitting, as her lipstick is applied. Anna’s dad walked in the room and saw his daughter as a bride for the first time. Whenever I asked Anna & Neil what they were looking forward to most about their wedding day it was always the people– friends and family. The line-up of men by his side dressed to the nines and ready to go on the morning of his wedding really said to me that they feel the same way about him! I love how my second photographer was about to really capture the blue sky in this photograph. The couple was wed at the “Holy Name of Jesus church” in Paxtonia, just outside of Harrisburg Pennsylvania. I loved working there! So I have this thing for symmetry and I have to say I really liked working in this church :). The priest was also super friendly. The funniest moment of the ceremony: when Neil tried to kiss Anna before the appointed time and the priest had to stop him!!!! The bridal party stood outside of the church waiving streamers and welcoming the newlyweds, they may or may not have been chanting “booze and snacks” haaaaaa…. Gorgeous cake by the Couture Cakery— I’m obsessed with this cake topper! Anna shared, “The dance floor was electric. Everyone was having a great time. At one point we had a large conga line for the song ” I would walk 500 miles” and we played a big range of songs. Neil even sang “I think I love you”. DJs were great!” She is referring to the team at Klock Entertainment. Anna and Neil, thanks so much for trusting me to capture these once-in-a-lifetime moments for you and your families and friends! I hope that they are as creative, beautiful and unique as you had hoped and truly capture the story and spirit of your day!!! I can’t wait to hear what you think! These pictures are amazing! You captured the day so beautifully. I am so impressed with everything you did! The engagement pictures were stunning, you were so helpful throughout the whole process and you and your husband were so professional, yet you felt like old friends. We picked the perfect people to share the day with. The photos are a treasure to us, I can’t believe how great they turned out! Thank you for such beautiful keepsakes!!! !